So the Michigan State Fair is gone - maybe forever - but Joel Radio has you covered and Joel and guest Harry Artin are here with all you need to know. Like Harry's crazy. Maybe you knew that, but his performance at the State Fair was nothing short of extraordinary. Feeding lemonade to the livestock? Check. Eating a disgusting amount of corn on the cob? Check. Receiving oral favors from a calf made entirely of butter? Check. You must hear this show, as Harry describes his wild behavior, discusses his future plans with a butter teat, and why he won't eat that much corn anymore. Plus, the guys see Billy Squier perform at the fair, and even five days later he's still probably playing a guitar solo. We discuss the the highs and lows of the show and pinpoint exactly when Billy's career went teats up. Also, "Beatles Day" arrives and Joel was too greedy to really enjoy it. Find out Joel's painful dilemma, get a full review of Rock Band: The Beatles, and much, much more on this crazy show. 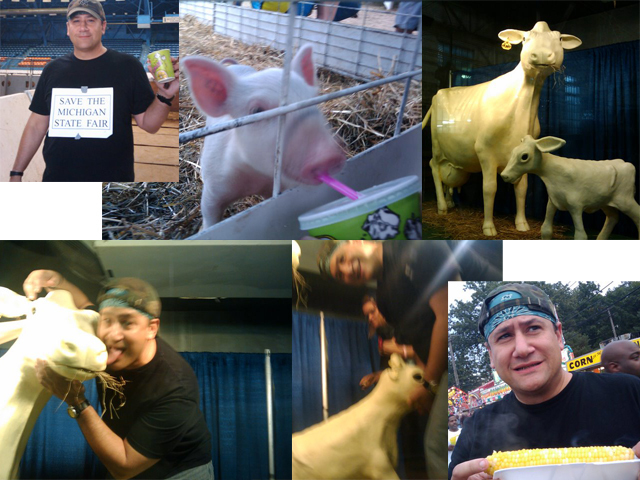 Sweetening the pig and the other goofy highlights of Harry's day at the fair.